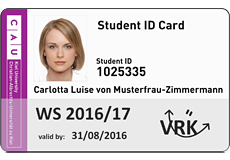 In the summer semester 2016, Kiel University will begin issuing the CAU Card, a new student ID card. 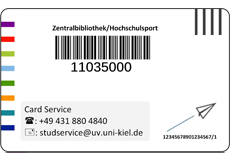 This card will be issued once to all students at Kiel University and then activated on a semester-wise basis. The first activation will take place in the winter semester 2016/17. The paper-based student ID cards and semester tickets that have been issued for the summer semester 2016 will remain valid until the end of September 2016. The Card manufacturer is planning the shipment of your CAU Cards for calendar week 25 (Kieler week). So your CAU Card should arrive during week 26. Please check your deliveries for an envelope with CAU logo.